When I started writing my blog a few years ago, I only hoped to create a document of my journey as a stay at home father. It's fascinating how things change. After reading my blog, a friend of our family shared some of my work with Mario Daniels, who was starting up a magazine named Dapper Dads. After exchanging some e-mails, he asked me to contribute something to the magazine. I was honored. So, I went about writing an article focusing on advice for my daughter. These were lessons I had learned during my life. I titled the piece Lessons From An Imperfect Dad. 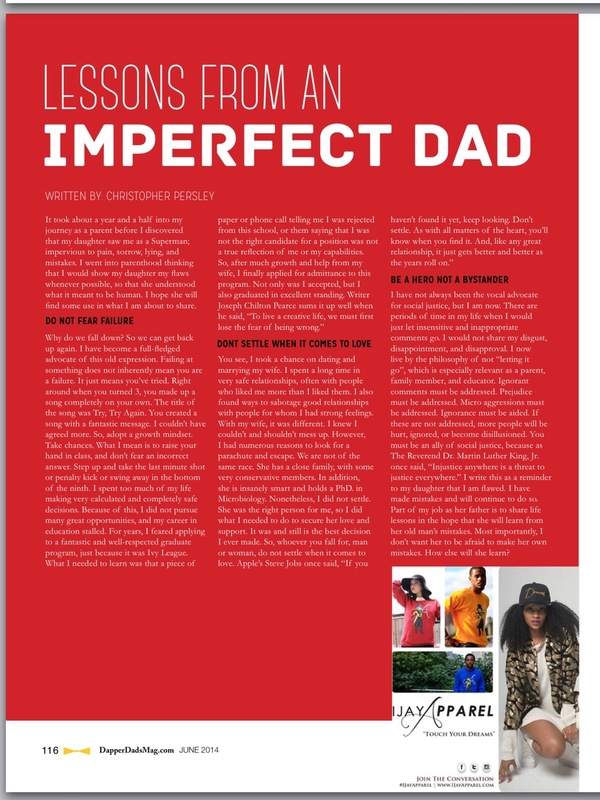 Head over to the Dapper Dads website, download a copy, and check out this new, exciting magazine! Look out for my article on page 116. Here is a screen shot of my article! Posted on June 24, 2014 by Christopher Persley.